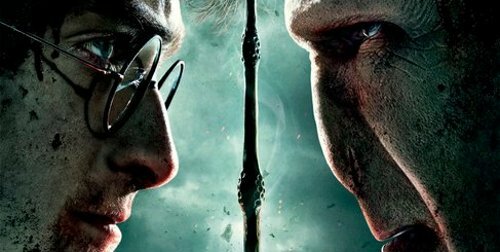 Because this is a re-ranking, I thought it fitting to hit the last two films of the HARRY POTTER series in one article. I’ve addressed them individually here for the first, and here for the second. In this article I will look at them as separate and together, while giving each an individual ranking. I’m glad Liz and I got through the series here in the course of a couple of months. It has been a sickness filled March, and we really needed a couple of nights to shutter ourselves in. HARRY POTTER was not the plan, but it was a somehow fitting way for us to turn into vegetables on the couch and recharge some batteries. What a great series this is! I watched HARRY POTTER AND THE DEATHLY HALLOWS: PART 1 (2010) 1 on 3.23.12. I watched HARRY POTTER AND THE DEATH:Y HALLOWS: PART 2 (2011) on 3.24.12. For each, it was my second viewing of the film and first since the opening weekend of their respective theatrical runs. I read that the original DEATHLY HALLOWS script was roughly five hours in length. The decision was made to split it into two films. While the producers surly salivated at the idea of doubling their box office bank, this was also an excellent creative idea for this series. A three and a half hour last film would have been both two long by series standards, and unnecessarily truncated in terms of what the filmmakers wanted on screen. The book works well as two separate movies, and it allows us to move through the climax with these characters at a methodical pace. In my original article I complained that they spend too much time in the first movie not doing anything because action would require the climax to come too quickly. Seeing the series as a whole, that was a misguided statement. The intricacy of the Hermione, Harry, Ron triangle needed one last sharp jab. I’m glad they never went for a love angle with Harry and Hermione, it would have been trite, instead the jealousy is born from a real sense of Ron feeling secondary, and learning that Harry’s place as ‘The Chosen One’ to the rest of the wizarding world didn’t necessarily apply to their friendship. The hesitation in the action feels to me, on second viewing, more like what I feel the intent was: These kids are in no hurry to rush into what may be their death when they haven’t even sorted out their own lives. The two DEATHLY HALLOWS films provide a few of my favorite moments, including an inspired animated sequence and the retribution of Snape. But picking out certain pops should not run counter to the fact that the aggression of these films, especially Part 2, is unyielding. Characters we have come to love pop on and off screen. Many die, some we are allowed to witness, others we learn of when Harry does. Noone is safe, and this series concludes light years away from the safe place in which it began. Hogwarts, once that haven for children who want to learn, first gets turned into a Nazi-style children’s camp (catch the paraphernalia in the Ministry of Magic, too), then it is all but destroyed. The acting in these films is underrated. The three leads have all become synonymous with their characters. One cannot envision anybody else playing them at this point. But the work of the supporting cast is phenomenal. The actors take it seriously enough to avoid some of the silliness of the early entries in the series. There are dark, dangerous, brooding characters. And some of those characters, Snape and Dumbledore’s brother for instance, are the GOOD GUYS! Any time you have a might and magic movie, there is a fine line between good acting and eye-rolling inanity. This final chapter never once falls on the eye-rolling side. While I still find ORDER OF THE PHOENIX to be my personal favorite, PATS 1 and 2 are right their with it. There are so many visceral, satisfying moments in this conclusion that a fan of the series cannot help but feel roused. Maggie Smith gets her moments, Harry gets his of course, even freakin’ Nigel becomes the big hero in the end. The tragedy of Snape is that his great reveal comes post-mortum. Though if there is one character whom I wish got a big moment in the finale, it would be Hagrid, who ends up chained and ineffective. I’m very glad I got to revisit this entire series. Not did I get all the rankings on the books, but it solidified this as, not only one of my favorite filmed fantasy series, but one of my favorite movie franchises of all time. Two bonus points here, one for the amazing animated sequence, one for the score. The score in Part 1, aiding a more open-feeling film, is the best score of the series. Suffice it to say, both films grew on me. Particularly in the area of writing! ~ by johnlink00 on March 25, 2012.